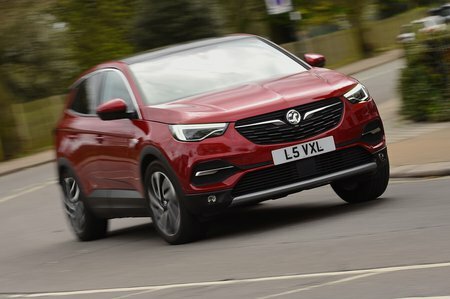 Vauxhall Grandland X 1.5 Turbo D Tech Line Nav 5dr 2019 Review | What Car? What Car? will save you at least £604, but our approved dealers could save you even more. We’d recommend going for the Tech Line Nav model, which is still reasonably priced and adds a host of desirable features, including a bigger 8.0in touchscreen with built-in satellite navigation, 18in alloy wheels, front parking sensors, privacy glass, a powered tailgate, keyless entry and start and ambient interior lighting. Importantly, you also get more safety kit, such as automatic emergency braking, lane assist and blindspot monitoring. This 118bhp diesel is far less urgent when you put your foot down than the petrol, but it does have solid mid-range shove to pull the Grandland X ably enough, even when it’s fully loaded. Average fuel economy varies from 61.4mpg if you specify an automatic gearbox and the grip control system to 70.6mpg in a manual car with regular tyres, while CO2 emissions are as low as 104g/km. Unless you're a company car driver looking to keep your tax bills low, we'd stick with the petrol.